The Trump administration always is happy to do its best to roll back anything the Obama administration did. So it came as no surprise that the Department of Education under Besty DeVos is considering changing federal sexual harassment policy in a way that reduces the burden on the colleges and also extends greater rights to those accused of harassment or assault. But in what is surely a bonus from the Trump administration perspective, the new policy has the potential to harm transgender students, who suffer high rates of campus harassment. “This regulation will only silence the voices of those who most need to be heard, and encourage colleges to skirt by while ignoring the law and the needs of their own students,” said Harper Jean Tobin, Director of Policy at the National Center for Transgender Equality. It would also raise the bar for finding a student guilty of harassment. At present, schools can use decide that “preponderance of evidence” is enough for disciplinary action. The new policy would allow schools to use a “clear and convincing” evidence standard, as long as they apply the same standard to all civil rights investigations. In what would be the most unsettling change for trans students, DeVos is pushing for mediation in lieu of a university investigation. That would allow victims and the accused harassers to cross-examine each other. The Obama administration strongly opposed such examinations on the grounds that it would be “traumatic or intimidating” to the victim. All of these changes are in line with DeVos’s antipathy toward trans students. During her tenure, the Department has stopped hearing complaints from students seeking to use bathrooms consistent with their gender, okayed federal funding for schools that discriminate against LGBTQ students, and considered changes to school disciplinary policies that would harm LGBTQ students. That’s all in a day’s work for DeVos. However, the changes are a reminder of the long-term damage being done by the Trump administration. 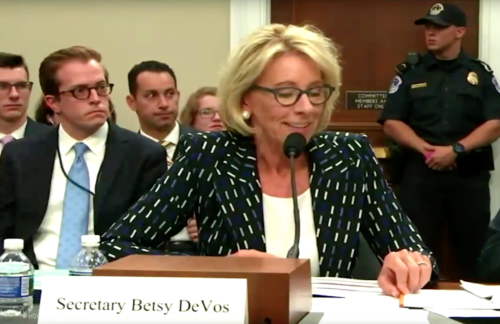 While the president’s tweets get all the attention, it’s the behind-the-scenes work of DeVos and her Cabinet peers that are daily making life more difficult for LGBTQ people.